Cover Blubber is a stretchy and reusable alternative to traditional plastic wrap. 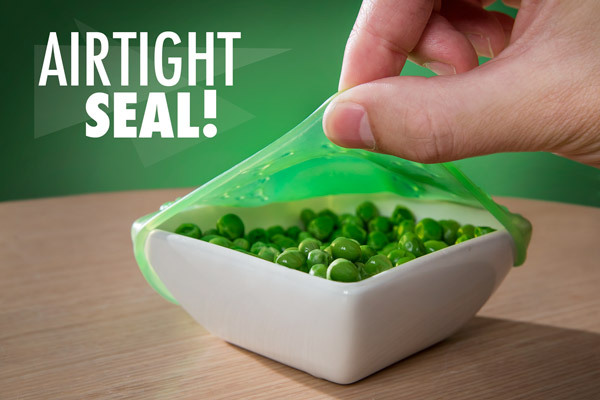 Made from food-safe StickyRubber™, Cover Blubber can stretch and cling to any shape. It will form fit to freshly cut food, preventing oxidation and preserving it. 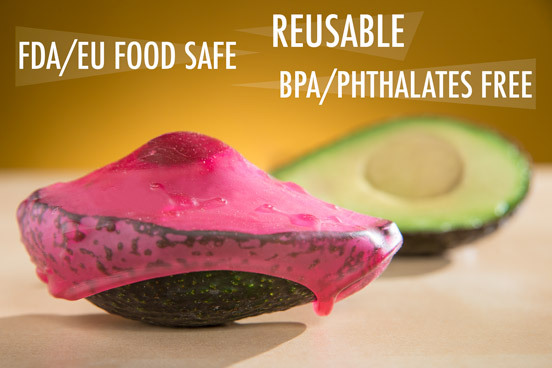 BPA and phthalate-free Cover Blubber creates an airtight seal on containers, preventing both messes and spoilage. Each pack includes four different sizes of Cover Blubber in order to seal items up to 12" across. Replace plastic wrap with reusable Cover Blubber! Plastic wrap is great, but it does have a few drawbacks. It isn't reusable and it certainly isn't very biodegradable. Enter Cover Blubber! Made from StickyRubber™, a super tacky and super stretchy material, Cover Blubber is the reusable alternative to traditional cellophane wraps. Cover Blubber is made from StickyRubber™, a super sticky and stretchy food-safe rubber. Cover Blubber stretches and clings, seals airtight, and form fits to just about any size container. Quickly and safely cover your food for refrigerator and freezer storage. Prevent spoilage and leaks thanks to Cover Blubber's airtight seal. Cover Blubber form fits to just about any container or food shape. For best results, we recommend that both your hands and the item being covered are dry. 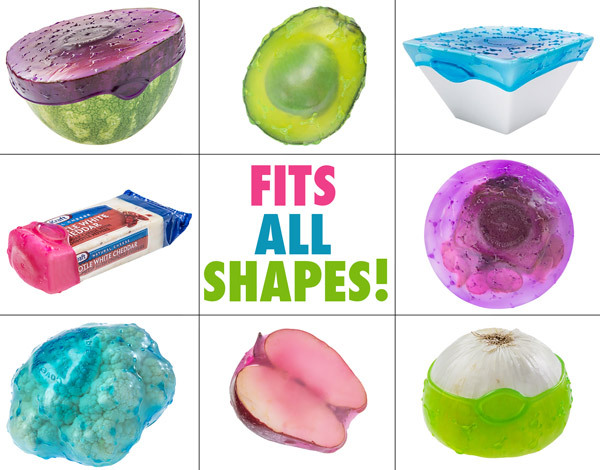 Cover Blubber form fits to nearly any shape! We love Cover Blubber because it's reusable and it easily forms an airtight seal due to its intense stretchiness. But it's equally important that items that come into contact with your food are safe. Cover Blubber is certified as both FDA and EU food safe. It's also BPA and phthalate free. So, feel free to cover away with reckless abandon. Cover Blubber is reusable and certified by the FDA and EU as food safe. 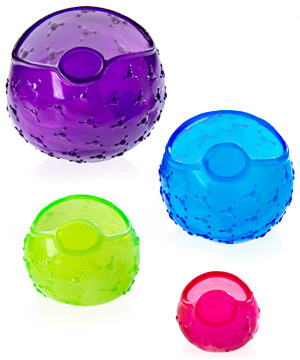 Four-pack of Cover Blubber fits up to 12" objects! Each 4-pack of Cover Blubber includes one each of the four sizes listed below. From avocados to pineapples and from dipping bowls to dinner plates, Cover Blubber has got you, well... covered! Every order of Cover Blubber includes the four sizes pictured above. Question: Will Cover Blubber ever get stretched out of shape? Answer: In our tests, no way! As long as you don't over-stretch the material, it will always rebound to its original shape. Its reusability is why Cover Blubber is such an effective plastic wrap replacement. Question: Can I use it in the microwave? Answer: No. Cover Blubber is not microwave safe. Question: Will it fit/work with my grandma's 18th century (and oddly-shaped) serving platter? Answer: As long as the object is under 12" across, it should be fine. However, please keep in mind that Cover Blubber works best on items that are uniformly shaped (think circles and squares). Question: How is Cover Blubber safer than traditional plastic wrap? Answer: Prior to 2006, most plastic wraps were made from PVC which contains phthalates. Phthalates can disrupt hormones and they also leach into food wrapped in plastics made with them. Thankfully, most (if not all) plastic wraps today are not made with PVC, but instead are made with LDPE. Annoyingly, LDPE plastic wraps don't adhere nearly as well as the old-style PVC plastic wrap. More concerning, however, is that LDPE may contain DEHA (another hormone disruptor linked to breast cancer in women and low sperm counts in men). Of particular concern is how these chemicals can leach into your food when used in a microwave. Bottom line: Plastic wraps may or may not be safe — the jury is still out. And in all honesty, we still use it in many instances. However, using Cover Blubber is oftentimes easier (as it is far stickier than these newer plastic wraps) and it doesn't fill our landfills with tons of hard-to-degrade plastics. So, give Cover Blubber a try. We're sure you'll love it!